When Gryffin died, Kevin and I were shocked – shocked because we’d had no warning, shocked because he was only ten. We used to joke that we’d have him “forever” – or at least for 14 or 15 years. After all, he was a mutt, and they outlive their pure-bred brethren, don’t they? Two months later — still floundering in the fog of grief, we adopted Galen; she was eight weeks old, four weeks younger than Gryffin was when we adopted him. It never dawned on me not to adopt a puppy. The younger the dog, my subconscious whispered, the more time before good-bye. With thinking like mine, what’s to become of older dogs on the rescue circuit? Fortunately, there are (many) people wiser than I am, who know that time truly is what you make of it. My second guest post comes courtesy of Jane from Knoxville. Goldie was ten when I first saw him. He was brought to a meet and greet that the Golden Retriever rescue group I was working with was participating in. His coat was thin and patchy and shaved from mid-tail to mid-hip. The bare space was covered with a long series of broad stitches. What had been there, I was told later, was a growth the vet tech described as having the size and appearance of “an exterior brain” on a stalk. He was thin. He weighed 52 pounds. His eyes smiled softly, as softly as his tail wagged whenever anyone came up to greet him. Few did. Most were occupied with the gorgeous, blonde, two year-old, fluffy Golden girl I was attempting to hold. I kept looking back over my shoulder at him. He would return the glance. At the end of the event, he would have to go back to the vet’s—not for any medical reason, only because he had no foster. I watched as he introduced himself gently to anyone who would come up to him. And I couldn’t stand the thought of him in a cage. I asked a leader in the group if I could take him home. She smiled when I asked. I think she knew that’s where he’d stay. And stay he did in my studio apartment with me and the Shih-tzu a generous woman had given me a few months earlier when she decided he needed a chance at more attention than he was getting. Me, Oreo, and Goldie in my tiny apartment. But Goldie was happy. I am not sure how many of the ten years he’d lived had been outside, but the old boy loved the air conditioning, the soft carpet, the eight cups of dog food I gave him daily to get his weight up and being close by, so he could stick his big wet nose over the edge of the bed whenever he felt like it. He didn’t seem to mind that the apartment was small. A walk was good, too. He and Oreo and I, a comical looking mismatched bunch, would make our perambulations around the complex and he would stop to greet, in fact, he would insist on greeting whoever we passed. I have come to call it “Goldie running for mayor.” Soon, little scaredy Oreo was following right behind him and whoever we happened on to had better not be in too much of a hurry to stop and socialize with these unlikely twins. Or they would get an affronted look. A really affronted look. Once we passed some boys playing soccer. Goldie’s head came up. He was alert. His big ears swiveled forward. He watched, stolid and earnest. The tail flicked back and forth. I could tell he was remembering. I could tell that as surely as if he had said it out loud. And it was a happy memory. But he didn’t yank on the leash and try to join in. He seemed to know he couldn’t do that now. But he could cheer them on. Even if it was from the sidelines. It was a lesson. It was by no means the only lesson. Goldie was chosen to be a “Ruff Reading” dog. I accompanied him to the kindergarten class where tiny, delighted students practiced by reading him books about frogs and birds and sometimes even dogs. After a couple of books, he’d put his big head on a small lap and lick the book maybe or stick out a paw as big as one of the kid’s hands in thanks. And they would pet him. And pet him some more. When the teacher wasn’t looking, a kid or two would run over and sneak a kiss on his head. And he would lay there calmly. I think he was smiling. Puppies and young dogs are full of their own delights. Adopt an old dog and you’ve come as close as you may ever get to having an angel in your house. Once, when I took Goldie to the vet, a man said. “Now there’s an old guy. How long do you think you’ll have him?” I have no idea why someone would ask a question like that. The answer is this: All we’ve got is this minute. And the next one. And the next one. And however much love we can fit in them. 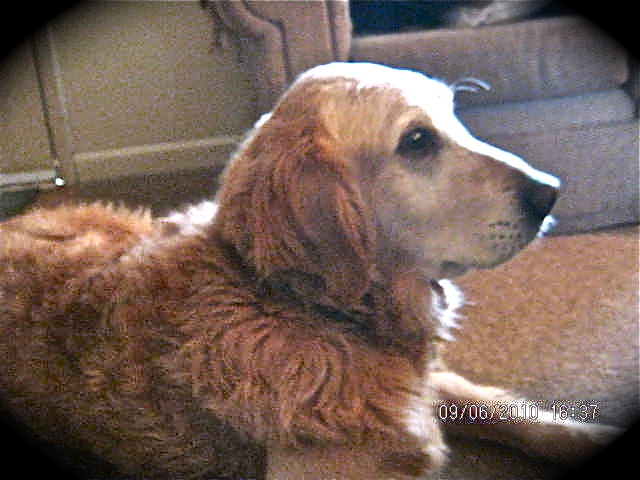 Goldie had to have another surgery to remove some golf ball sized cysts on his back and neck. More fur shaved. More stitches. The girls at the vet’s office who let him sit up front with them in the reception area called him “Frankendog.” But now he has a dense curly coat of gold and silver. He weighs 70 pounds. And he will be 12 in May. Oreo licks his ears and lies down next to him on his bed. I thank him for being here. For making the minutes full ones. This just brought tears to my eyes! Yes… Jane’s lovely words brought a tear to my eye, but also a smile to my face. Made me think about getting another dog — an older one. Wonderful story about adopting an older dog. Older people should also think about adopting a dog of any age. I have had dogs all my life. When my last dog died, I didn’t think my husband and I would get another dog. 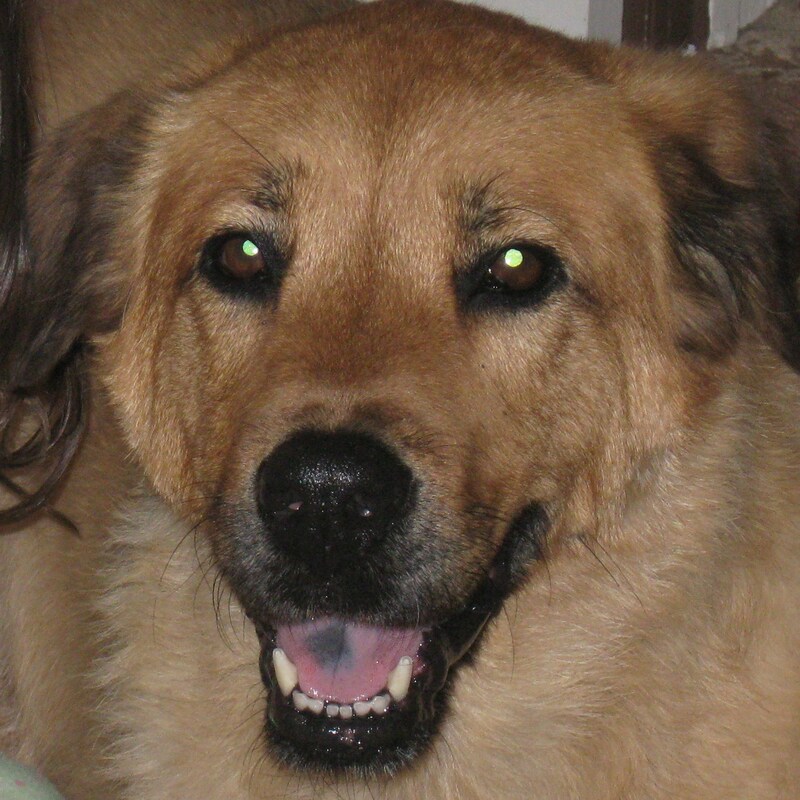 At 68 years old,presented to us was Loki, a rescue dog, by my daughter, her husband and our grandchildren. What a blessing! I really like this one because it reminds me of how I have to appreciate all of the things I have. I agree, Olivia. Jane’s story has lots of important messages tucked inside of it. I felt the same way when I read the story for the first time.